On Launch Pad 17-B at Cape Canaveral Air Force Station in Florida, workers watch closely as the second half of the fairing is moved into the mobile service tower for placement around NASA's Kepler spacecraft (left) to complete encapsulation on Feb. 26, 2009. This story was updated at 1:33 p.m. EST. NASA has delayedthe planned launch of its new planet-hunting Kepler spacecraft next week by oneday to allow time for extra rocket checks after the agency?s latest satellitecrashed into ocean on Tuesday. The nearly $600million Kepler mission is now slated to blast off from the Cape CanaveralAir Force Station in Florida on March 6 at 10:49 p.m. EST (0349 March 7 GMT),NASA officials announced late Thursday. The extraday gives NASA engineers more time to double check systems on the protectiveclamshell-like shroud at the nose of the Kepler spacecraft?s Delta 2 rocket toensure they will work properly. Kepler is a space telescope built to searchfor Earth-like planets in orbit around other stars. On Tuesday,NASA?s $273.4 million Orbiting Carbon Observatory plungedinto the ocean near Antarctica when the payload shroud of its Taurus XLrocket failed to separate as designed about three minutes after launching fromCalifornia?s Vandenberg Air Force Base. NASA is forming a mishapinvestigation board to root out the exact cause of the failed launch. The TaurusXL rocket is built by Dulles, Va.-based Orbital Sciences, Corp., and Kepler?sDelta 2 booster is built by the joint United Launch Alliance. But NASA wants tobe extra sure Kepler and its Delta 2 rocket will not suffer the same fate asthe lost Orbiting Carbon Observatory despite having a different manufacturer. ?They wantto look at all the systems and check any similarities between the Delta 2 andTaurus rockets,? NASA spokesperson Tracy Young said Friday from the agency?sKennedy Space Center near Kepler?s launch site. Young told SPACE.comthat Kepler mission managers have postponed a planned Saturday meeting todiscuss whether the spacecraft is ready for flight until Monday. 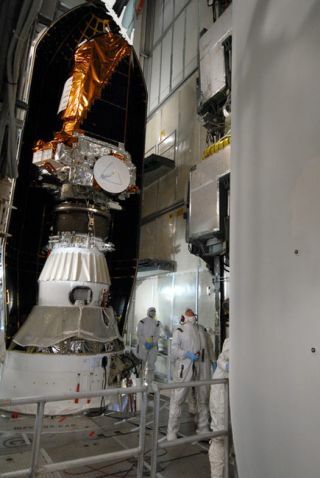 If all is wellthen, Kepler will be cleared for a late Friday launch, she added. The Keplerspacecraft is expected to spend at least 3 1/2 years searching a 3,000light-year target zone for signs ofextrasolar planets about the size of Earth or larger. To date, more than300 extrasolar planets have been discovered circling stars in our Milky Way galaxy,most of them the size of Jupiter or larger.